It is possible to have your older 2x Bino Vue Amplifier retrofitted to accept 1¼" filters. The retrofit service includes Bino Vue Flat Coupler (which replaces the ¾" long black nose piece on your Bino Vue), and installation of a new lens retainer with 1¼" filter threads. The Bino Vue Flat Coupler allows space for the new retainer and a filter to fit between the end of the 2x Bino Vue Amplifier and 2" diagonal mirror without interference. Please call Tele Vue for a Return Authorization Number if interested. Call for details on the Bino Vue Filter Upgrade. 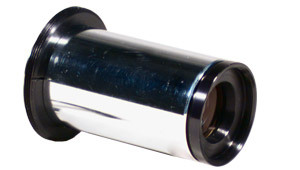 Bino Vue Flat Coupler is also available separately from Tele Vue Optics dealers. Bino Vue Flat Coupler (left) and lens retainer with filter threads (right). Older retrofitted 2x Bino Vue Amplifier can now accept filters.